Kentucky's largest city is home to nearly a dozen bourbon distilleries and the cocktail experience of the Urban Bourbon Trail. Whet your appetite with this one-day tour plan. Breakfast - PLEASE & THANK YOU* – Start your day with a locally baked pastry in the NULU district. This hip coffee/music shop combo is known for its chocolate chip cookies and wide selection of vinyl records… and is a favorite place of Teddy Abrams—the young, hip Music Director/Conductor of the Louisville Orchestra. COPPER & KINGS AMERICAN BRANDY - Based in Butchertown, Copper & Kings is making dynamic American style brandy. Tour this modern distillery, where guests will learn about the brandy distilling process. Visitors will also tour the 75% underground, naturally climate controlled brandy cellar where the barrels are sonically aged through music. ANGEL’S ENVY DISTILLERY – Opened in 2016 along historic Whiskey Row, Angel’s Envy offers visitors a fully operational urban distillery experience unlike any other. See the distillation process from beginning to end, with the tour ending in the Finishing Room with a tasting of Angel’s Envy. JIM BEAM URBAN STILLHOUSE DISTILLERY - Located in the heart of downtown Louisville at Fourth Street Live! 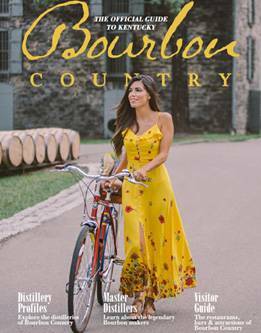 Giving visitors an understanding about Bourbon without leaving the Louisville city limits. Lunch - DOWN ONE BOURBON BAR* - An official stop on the Urban Bourbon Trail- With more than 160 Bourbon and a “Get Splashed” wall perfect for photo opportunities, it’s no wonder that Down One Bourbon Bar has been named one of National Geographic Travel magazine’s “Best in the World: Must-See Places,” and has been ranked one of the Top 60 Bourbon Bars in America by the Bourbon Review. EVAN WILLIAMS BOURBON EXPERIENCE - Located on Louisville’s historic “Whiskey Row” featuring an artisanal distillery, tours, tastings and more. Celebrating the legacy of Evan Williams, Kentucky’s first distiller, this immersive experience brings to life the history and tradition of Kentucky’s native spirit. FRAZIER HISTORY MUSEUM - “Spirits of the Bluegrass: Prohibition & Kentucky” brings the 1920s to life & shows how millions of otherwise law-abiding American chose to violate the national alcohol ban in order to satisfy the country’s thirst for illegal booze. With two full bars, a Speakeasy, flapper dresses all around, and Al Capone hanging out in a back corner—get ready for a party. In the 1920s you needed a doctor’s note or a special Speakeasy password to imbibe some liquor. Today, the great stories and spirits are much easier to come by. While at the Frazier Museum, be sure to check out “The Hunger Games: The Exhibition,” now showing through September 10. KENTUCKY PEERLESS DISTILLERY - While it is one of the newest distilleries in downtown Louisville and home to the only urban bourbon rickhouse in the city, Kentucky Peerless is an old family brand that is steeped in four generations of rich history dating back to the 1860s. BULLEIT FRONTIER WHISKEY EXPERIENCE AT STITZEL-WELLER - One of the true cathedrals of the American whiskey industry. Originally opened in 1935, now home to Bulleit, Blade & Bow, IW Harper and Orphan Barrel. Happy Hour - PATRICK O’SHEA’S* - An official stop on the Urban Bourbon Trail- Located along historic Main Street in the Iron Quarter District, also known as Whiskey Row, Patrick O’Shea’s is located in the Old Charter Bourbon Distillery Warehouse. The old warehouse was renovated to maintain the history and integrity of the building with exposed brick walls, refinishing the 150-year-old floors, and utilizing reclaimed-wood beams as tables. Dinner - HARVEST* - An official stop on the Urban Bourbon Trail-More than 80 percent of all the products used at Harvest are sourced within 100 miles of the restaurant’s front door…including the more than 100 Kentucky Bourbon’s behind the bar. Nightlife - RYE* - An official stop on the Urban Bourbon Trail- Capitalizing on the unrivaled products of local farms, Rye focuses on sustainable, seasonal ingredients which allow the restaurant to offer fresher, cleaner more flavorful cuisine. *Restaurants listed are recommended based on location in relation to the itinerary stops before and after meals and relation to theme of itinerary. For more dining ideas, search by cuisine or neighborhood. Click here.